Your caravan awning measurement or 'A' measurement will be in your hand book for your caravan. If you don't have a hand book then the correct way to ascertain the 'A' measurement is to measure from ground to ground, along the caravan channel (as shown by the dotted line on the diagram). How to measure your Caravan Awning The "A-A" measurement is easily done by running a length of string from the ground, around the awning channel to the ground at the other end. You will find that this is easier to do with two people than struggling to do it alone. Lay the string out straight and then measure it in centimeters (cms). This will be the size of awning you require for your caravan. Most awning makers have sizes in ranges. For instance, you may measure your awning as 934 cms. A maker may offer 950 which is 925-950 range. Another will offer a 960 which is 930-960 range. The size ranges may differ, but the principle is still the same. In any case, armed up with the exact measurement of awning you require, we will be able to easily advise you on what size range to get and you are less likely to make an expensive mistake. Then measure what you have in a STRAIGHT run of awning rail. 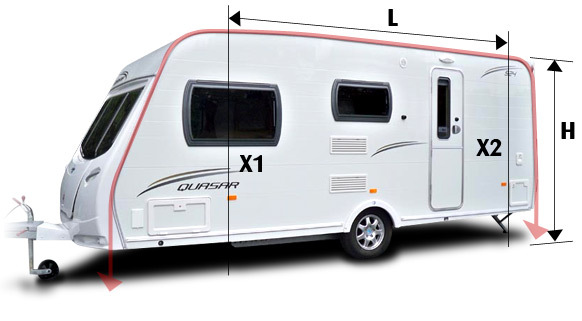 This measurement will be the maximum width porch awning your caravan can accommodate, but before you take this measurement look at the side of your caravan and visualise where you would like the awning to sit. Obviously, include the doorway, but take into account any windows as you may want the awning to fall short of these. Finish your measurement to this point. This will be your ideal porch awning width. Most porch awnings are advertised with a brand and model name followed by numbers, for example the Kampa Rally Air Pro 390. The number indicates the length of straight rail required for that awning, so in this instance you would need 390cm.